Home→Our Journey→On the Road→Back to the Summer of 2014 – Off To A Late Start! ← WooHoo! Heading “Home” – Again! 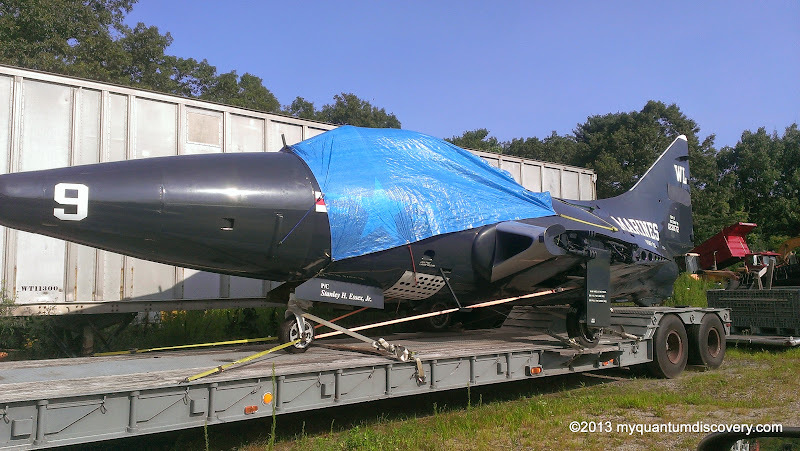 Back to the Summer of 2014 – Off To A Late Start! At the beginning of August 2014, after our whirlwind tour to Indiana and Michigan for assorted RV services, then a three week stint in Albany, NY while Dad underwent and recovered from quadruple bypass surgery, we finally packed up our stuff and the kitties and moved from the coach down to our boat Quantum Leap at the EGYC (East Greenwich Yacht Club) in East Greenwich, RI. 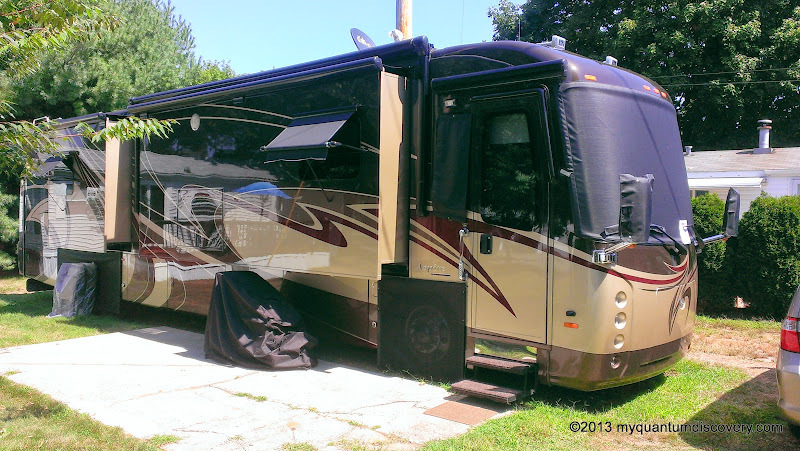 Our coach, parked at our summer site at Sun Valley in East Greenwich, RI, was ensconced in her sunscreens, the A/C’s set for “dehumidify” mode, the tires “planked” and was otherwise all setup for an extended stay in one place. So OK we had a belated start, but why didn’t we post anything in real time last summer? Not sure! Guess we just didn’t feel the urge. We did have a lot of projects in process on Quantum Leap and were pretty busy, and maybe the weak internet access at EGYC had a lot to do with it, but there’s no specific reason. Not to worry though, albeit a little late, your going to hear about it over the next few weeks anyway ! Actually we did have another service “event” for the coach early in August. The Hydraulic reservoir tank began leaking and had to be replaced. 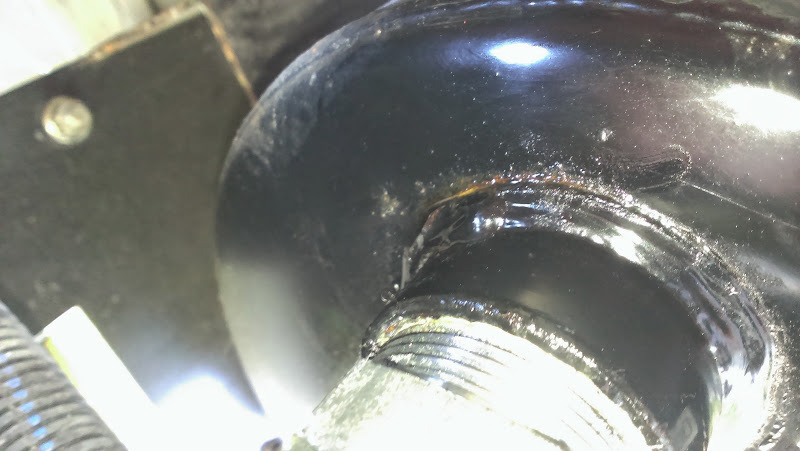 One of the fitting welds on the steel tank decided to reveal a flaw sometime during our trip back from Indiana. A call to Spartan and a new tank was on its way. Our local Spartan service center, Interstate Diesel did the work towards the end of August. Luckily they are less than a mile away and flexible with scheduling. That little outing also provided an opportunity to exercise the coach after a few weeks of sitting around. Did we want to stay in boating? Did we want to keep Quantum Leap? Had we actually made that dubious transition to the “Third” stage in a modern sailors life? (The four primary stages of the life of a contemporary sailor are: Sailboat → Powerboat → Motorhome → Nursing Home.) That sequence usually elicits a laugh but there is a lot of truth in it too! Well, a big YES to the first question! 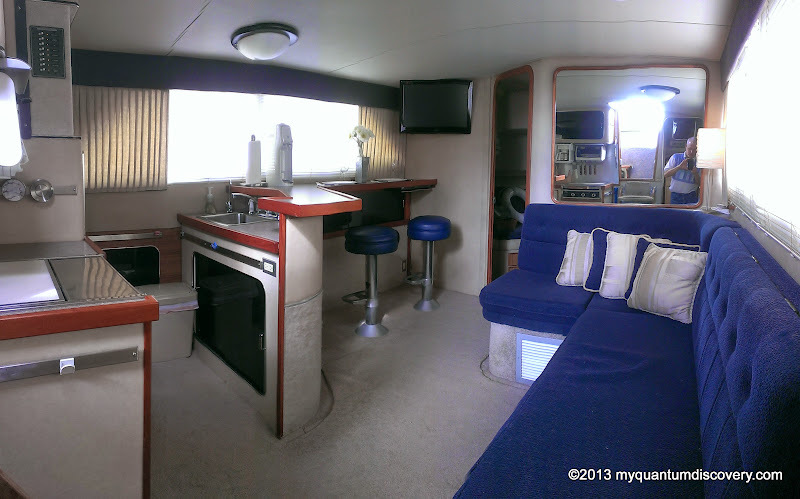 After just a few hours aboard it was immediately clear we are not ready to give up the cruising lifestyle just yet! Cooler temps, great views and no bugs are just a few of the benefits! 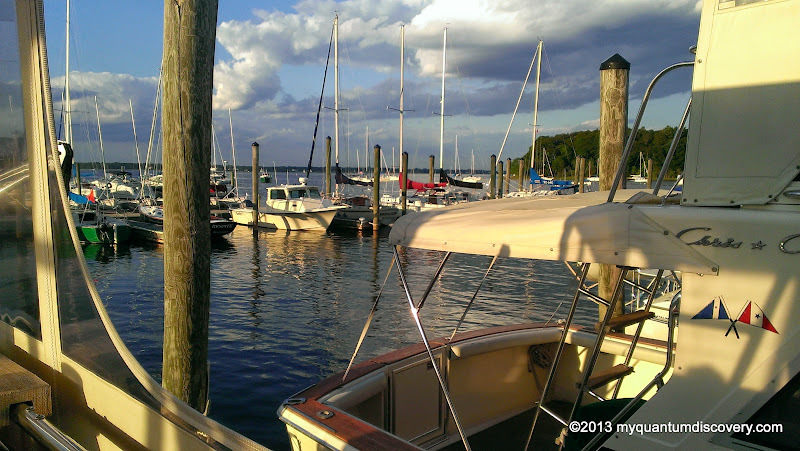 From a cost perspective we are extremely fortunate to have a situation that keeps our boating expense to a relatively low level. 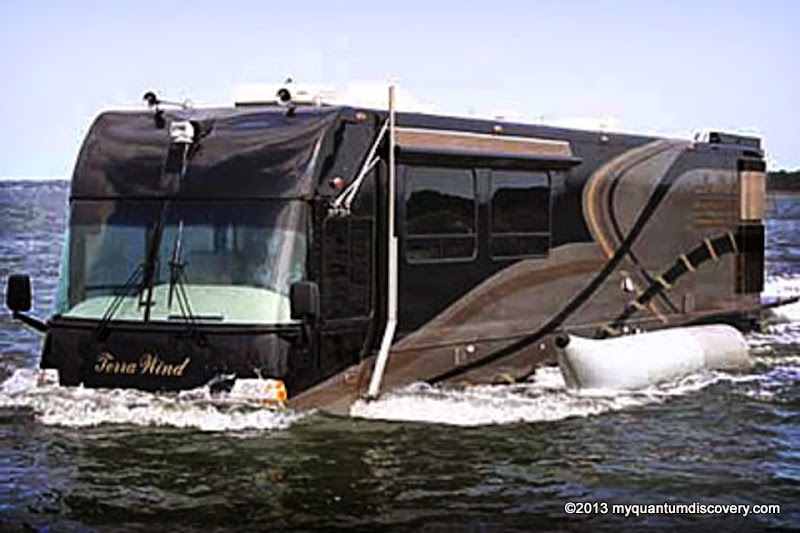 In fact it is notably less costly overall for us to live on the boat vs. the motorhome (but then there are those cold NE winters and the cost of taking our boat south to FL would easily be a five figure fuel bill)! Plus, did I mention you just can’t beat the views? 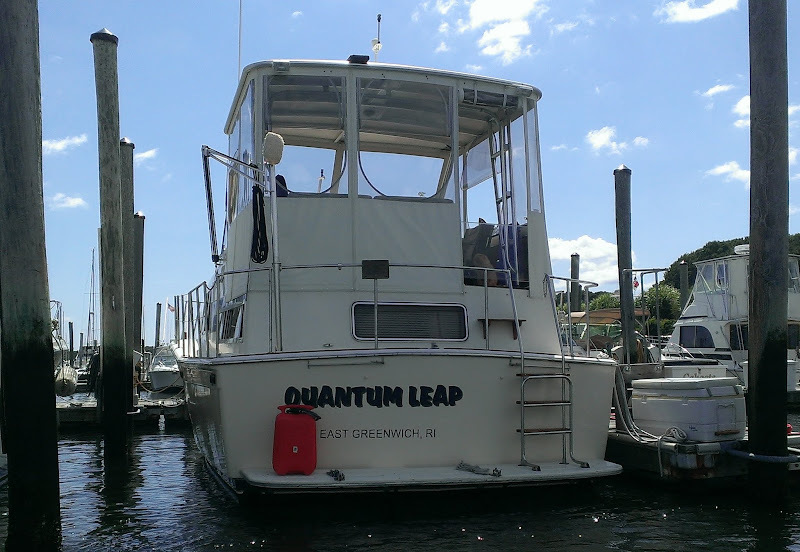 And MAYBE we will be keeping Quantum Leap! We have apparently been spoiled by the coach and all the comforts of home we have there like a washer & dryer. Also we would prefer a bit more room. In addition, to make Quantum Leap as “luxurious” as the coach, some “soft” upgrades would be required, but we are not sure it is worth the expenditure. QL is, after all, over 30 years old and not really worth much in the current market (even though we have done extensive upgrading to the mechanicals) – does it make sense to spend more money on her than she is worth, or cut our losses and buy something newer (like in the 10-15 year old range)? A question we have been pondering and calculating for quite a while now. We have been looking around at other boats but it seems only time and perhaps a serendipitous event will tell. So NO! we have not made that transition, at least not fully, into that third stage of life. Hey, as long as our health holds out we definitely want to stay active in the cruising lifestyle. It’s similar to RV’ing but has a completely different set of rewarding experiences to embrace and we just don’t feel we are ready yet to let go. After all we have been boaters for some 40 years and only RV’ers for 4. Keep Quantum Leap, so many good memories. Being spoil by the luxuries of the RV will only be enhanced by enduring something a little more simple, but come on it aint bad is it.